Millions of dollars and thousands of man hours are spent annually on industrial cooling equipment downtime, repair, and maintenance. 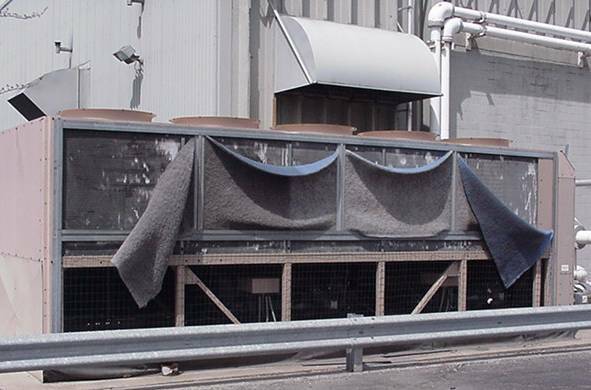 Failure to provide effective air intake protection to building and other equipment fans, motors, condensing units and coils adds up to a costly loss of productivity in safe and efficient system operations. Maintenance engineers today are finding that protective fins and louvers on equipment air inlets do not offer adequate protection to keep cooling systems running cleanly and efficiently. The need to hand brush equipment fins clean of debris, flush with water or cleaning solutions, and to make frequent filter change outs occurs all too often. Debris continuously drawn into the air intake insulates the coils, reduces the necessary airflow, increases run times, compressor pressure and energy costs. These changes in system performance increase maintenance expenses and decrease the life expectancy of the equipment. In addition, ventilation components are often located in constrained spaces or in awkward locations such as remote job sites. This makes periodic maintenance or emergency component failure repairs difficult and unusually costly. Reducing the buildup of debris such as dirt, cottonwood, leaves, grass clippings, bugs, construction and industrial debris is one way to decrease system vulnerability. Permatron developed and patented PreVent air intake protection filters as a primary pre-filtration defense to help prevent the damage and extensive maintenance that large volumes of debris can cause. Custom designed and manufactured to fit any sized air intake, the PreVent filter is constructed of three-dimensional electrostatic media. Permatron’s monofilament woven media is heat stabilized, and will not shed fibers, absorb moisture or promote bacterial growth. The additional benefit of the media’s inherent electrostatic charge is higher particle arrestance efficiency and enhanced ability to capture and hold smaller particles. 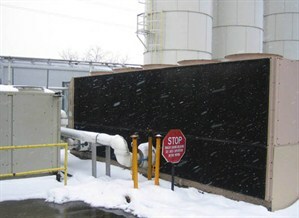 Designed for strength and durability, the PreVent air intake protection filter is UV protected, and stands up to extreme outdoor or indoor exposure, corrosive chemicals, high velocity air flow, as well as industrial cleaning and maintenance handling. Custom made to the exact perimeter of the air intake, PreVent has a variety of design features which allow filters to be attached easily and securely. As the saying goes, a picture is worth a thousand words. The 200 ton York chiller, is located at the industrial facility of Automated Packaging Systems Incorporated. A world leader in custom engineered packaging systems for over 40 years, this photo taken at the Garfield Plant shows an extreme example of unsuccessful air intake filtration. The $165,000 chiller was installed five years ago to handle their 250,000 sq. ft. facility, where extrusion of plastic sheeting and tubing for consumer packaging takes place. The facility also houses full color printing operations. Unfortunately they didn’t have a choice in their neighbors. The facility backs up to a busy set of railroad tracks that showers them with train soot, dirt and dust. Their other neighbor has an access road that is heavily traveled by dump trucks and heavy machinery on their way to the nearby road paving company. Digging up highways with stone and rock crushers, and then processing and transporting new paving materials throughout the area, creates quite a mess. Between the soot, rock particles and messy cottonwood trees, maintenance on the York chiller has been a very time consuming chore. The original filtration solution involved aluminum mesh filters that were screwed onto the front of the air intakes. Taking them off for periodic cleaning was not only a tedious process, but the metal mesh filters didn’t keep the inside compressors and banks of condensers clean. Hand brushing and flushing with water and cleaning solution were still required. The second filtration solution consisted of non-woven polyester filtration media. The photo at the top of the page clearly shows how unstable the media becomes when covered in heavy debris and soaked with snow and rain from ever changing Midwest weather conditions. These filters collapsed and all of the original cleaning was again needed. Then they turned to PreVent. Filters were designed and built to fit the enclosure exactly. With several options to choose from, this customer opted for hook and loop attachment running along all sides of the filters for a tight and secure fit. Outside debris is effectively blocked from entering the air intake system. Jim Lang, the senior electrician at the Garfield Plant, is quoted as saying “The filters are easy to remove, rinse and re-install. For a relatively inexpensive item, I am very pleased with the results that PreVent has had”. Historically, when the maintenance crew came to do their regularly scheduled flushing and washing of the chiller, the fins were a mess. Now maintenance is a breeze.